It seems impossible now that only a few short decades ago, bathrooms were still a neglected area when it came to residential and hotel design. Sterile, functional bathroom products dominated the market and the room in which many of us both start and finish our day was merely a utilitarian space in most homes and hotels. Renovating her own home, and frustrated by the lack of design and materiality available in the market, apaiser’s founder – Melbourne based, Belinda Try, embarked on a mission to find the extraordinary amongst the ordinary. Finding nothing which satisfied her desire to create a private sanctuary in which to revitalise and relax, an idea began to form. If one cannot FIND the perfect solution, the only answer is to CREATE the perfect solution… Right? Driven by this idea, and drawing inspiration from the genesis of bathing and traditional rituals, Belinda explored the use of natural, sustainable materials and the notion that the bath should be the hero of the bathroom, the gravitational point within the space , that she envisaged as a “spa like retreat” within your own home. Ancient Rome’s thermae, Japanese Onsen, and even the claw foot baths of the early 19th century, which were the height of luxury and indication of wealth, were a source of inspiration. Determined to transform bathing into a therapeutic and luxurious ritual once again, the freestanding bath was reinvented, and apaisermarble® born. The early collections were developed for residential installations and were simple, beautiful and organic forms, handcrafted from this natural and tactile, yet high performance material. Often replicated now, these iconic shapes are still some of our bestselling designs internationally. Whilst the conception of apaisermarble, the reimagining of the freestanding bath and development of stunning, sculptural bathware were revolutionary in themselves, the next ambitious concept from the apaiser team became the significant turning point in our story. apaisermarble®, was meticulously created to retain the natural feel and luxury of marble, whilst being robust enough to withstand the demands of the bathroom. Our private bathrooms were becoming beautifully curated sanctuaries and the local design community had embraced our approach to bathware. The hospitality industry and international design community was next, as was the introduction of bath couture – custom designed, hand crafted products created specifically to fulfill a particular brief. Some of the growth was organic, but strongly supported by a hands on approach to developing relationships and partnerships with international designers and retailers. Our global reach was immediate and the industry embraced this creative Australian bathware company and our beautiful, custom made, handcrafted products. As a result, stunning residences and commercial projects came calling, both at home and internationally. Two of our early key projects – InterContinental Hotel in Bali, Indonesia and the Eureka Tower penthouse in Melbourne, for which we created bespoke solutions, were the turning point in the direction of the brand. We have had the opportunity to work closely with some of the world’s most talented designers on beautiful, award winning and internationally acclaimed projects, for exclusive and luxurious hotel brands and developers. Collaborations with celebrated designers for some of our signature collections, have been incredible and rewarding experiences. Eighteen years and hundreds of projects later, there is still a thrill in walking into a 5-star hotel and seeing a piece we have designed in one of the bathrooms – knowing that our bathware, truly enhances hotel guest experiences, gives us a sense of excitement, pride and satisfaction. Our first abode was a modest, ‘by appointment-only’ showroom in Malvern. A short time later, the demand for the product had grown rapidly. After a momentous and life changing ‘are we mad moment’ – we moved into our flagship showroom in Richmond in 2008. Year after year we continued with our international expansion by completing large-scale projects in Asia, North America, UK and MEA. In response to demand in these regions we have progressively opened sales offices in key locations. In 2014 we opened our Singapore showroom, another significant milestone in our story. 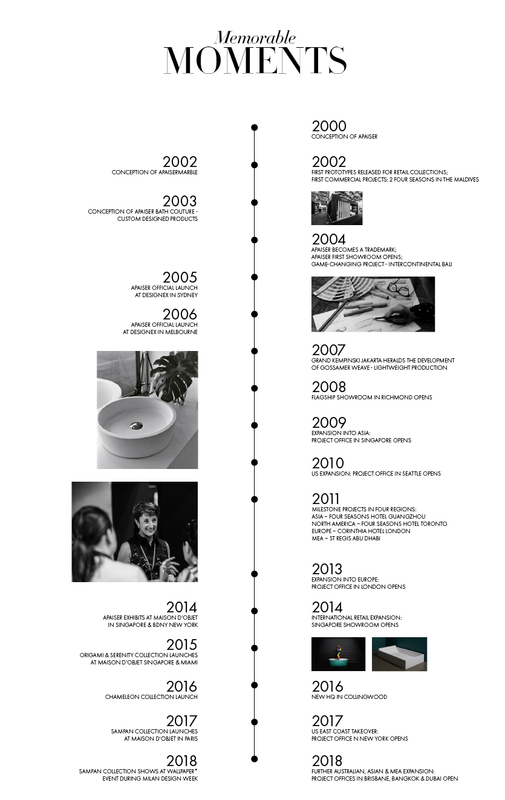 Since the foundation of apaiser in 2000, under Belinda’s guidance and drive and the efforts of an amazing team, apaiser has become the bathware of choice for international designers and discerning clients, for the most beautiful properties in the world. By continuing to demonstrate our belief in the value of artisanship, sustainable materials, design excellence and exceptional quality – this Australian brand, just like our stunning bathware – has been built to outclass and out last. I founded apaiser some 18 years ago – and when I think about how much time has elapsed since those early days, my mind turns to parallels with human life. In human terms, our brand is now a young adult – energetic, courageous and still filled with hope and passion! We are still fearless and determined to remain the ground-breaking leaders in luxury bathware. As we move forward, grow and mature, I am determined we will not lose the core DNA of our brand and the values I set out to instill in our team at the genesis of apaiser. Those early days of a by appointment-only showroom in Malvern, were exciting but terrifying, as we embarked on this adventure. I could never had imagined in my wildest dreams, how the world would embrace the concept we brought to the market in those embryonic years, as a small, creative, energetic and proudly Australian firm. We are proud of being the first company to bring marble stone bathware to the market and our unique bespoke offering into private homes, the best hotels and resorts globally. We have had such an overwhelming response from the industry since those initial successes in early 2000s, that continues driving us to innovate and create extraordinary bathware. Since our humble beginnings we have had the opportunity to work with the most amazing and talented designers all over the world and to be featured in some of the world’s best hotels and resorts and collaborate on their projects as partners. I admit – it has been challenging at times, and yet rewarding. As a very wise person once said to me, ‘if it was easy, Belinda, everyone would have done it!’. The reality is though that apaiser could not be where it is today without such an amazing team behind me every step of the way. The love for the brand and our beautiful product is something that truly brings us together – every one of the apaiser team gets a genuine thrill from introducing the brand to a new client for the first time and seeing their stunned reaction to what apaiser can offer. My fervent desire is for apaiser to grow, continue to design amazing products and continue to be a leader in the bathware industry globally.